Porsche has unveiled its latest research vehicle to the public for the very first time at the 2011 IAA Frankfurt Motor Show – the all-electric drive Boxster E. In the wake of the GT3 R Hybrid, 918 Spyder and 918 RSR, the mid-engine prototype is yet another sports car concept exhibiting the brand’s characteristic combination of research and driving pleasure. The Boxster E, with two electric motors (one on the front axle and one on the rear axle), runs on purely electric power with four-wheel drive and is equivalent to a Boxster S in terms of driving dynamics. Together with two other Boxster E research vehicles, in which one electric motor drives only the rear wheels, the prototype is being used to explore the everyday practicability of all-electric vehicles and how they are used, especially in terms of driving and battery charging. What the researchers are after is an understanding of the requirements facing future products, where to go next with Porsche Intelligent Performance and how to integrate electric vehicles into the infrastructure. The practical trials with the three Boxster Es are part of the “Model Region Electro-Mobility Stuttgart” large-scale trial. The Stuttgart model region is being sponsored as part of the Federal Government’s “Electro-Mobility in Model Regions” project. The Federal Ministry of Transport, Building and Urban Development (BMVBS) is making approximately 130 million euro available from the Federal Government’s economic stimulus package II for eight model regions nationwide. The project is being coordinated by NOW GmbH, the National Organisation for Hydrogen and Fuel C Technology. Thanks to its design as a mid-engine sports car, the Porsche Boxster is the ideal vehicle platform for conducting realistic trials with electric-drive systems. The open-top two-seater car is very light, enabling the new components that are the electric motor, battery and high-voltage technology to be accommodated within the vehicle in a crash-proof way. Together with the low drag, this reduces driving resistance for optimal range. Also of importance for a Porsche sports car, even one that is electrically driven, is the high driving dynamics potential, not least as a consequence of the balanced axle-load distribution peculiar to the mid-engine design. 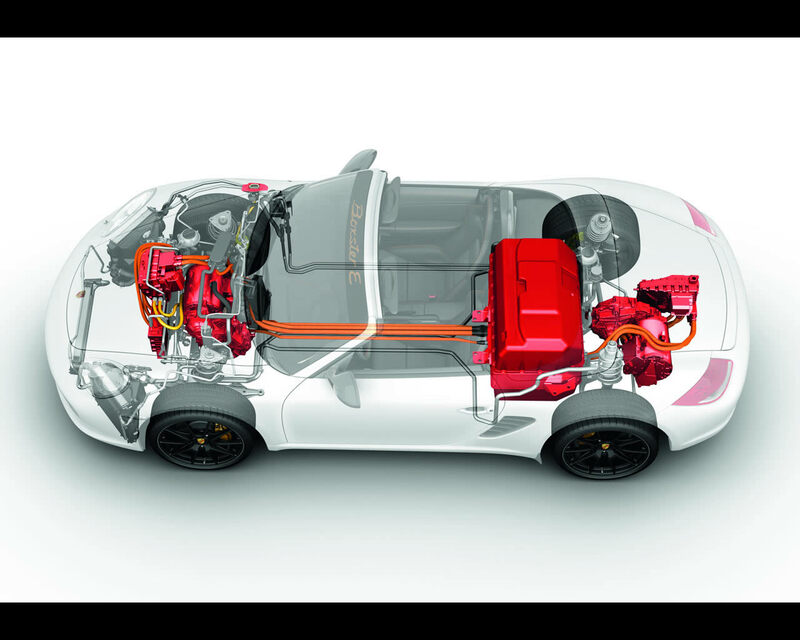 All-wheel drive without mechanical transmission of power- The rear drive unit comprising motor and transmission, together with the power electronics for controlling the electric motor is located where the manual transmission and exhaust system are accommodated in the conventional Boxster. In the front end, the space vacated by the 64-litre fuel tank, now redundant, is occupied by the second drive unit. The power electronics unit in the adjacent luggage compartment serves the front axle electric motor. 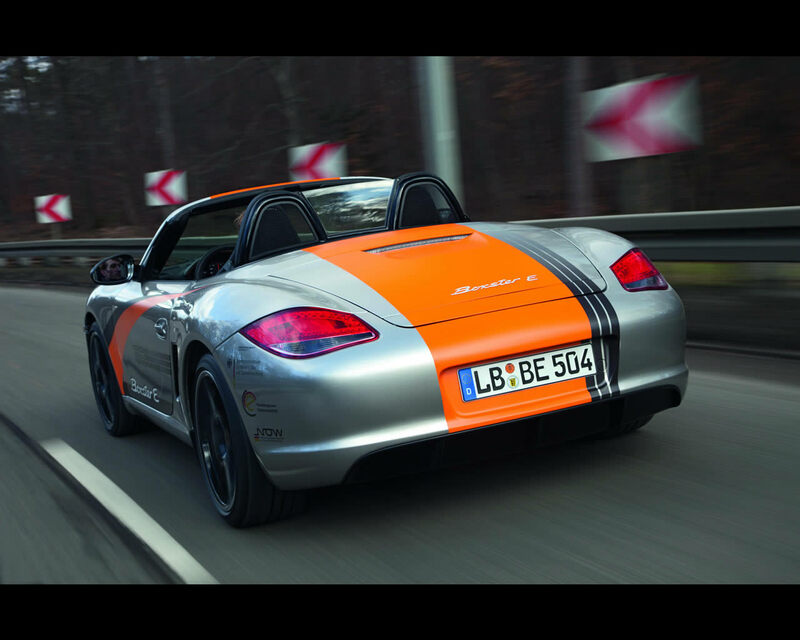 The Boxster E thereby features all-wheel drive without mechanical transmission of power. To ensure maximum driving stability and traction, a central electric control unit looks after the synchronisation of the two electric motors and controls the drive torque distribution to the front and rear axle. The two electric motors develop a total power output of 180 kW (240 hp) and a maximum total torque of 540 Nm at a maximum engine speed of approximately 12,000 rpm. That means that the two electric motors in tandem deliver significantly higher drive power than what is available from present day hybrid vehicles’ electric-power units. Not only does the Boxster E’s all-electric drive produce no emissions – it also offers a completely novel form of driving pleasure. The electric drive‘s maximum torque kicks in virtually from the first turn of the engine. The Boxster E moves almost silently while at the same time developing powerful propulsion from the very outset. The two motors enable the two-seater to sprint to 100 km/h in 5.5 seconds from a standing start. Its top speed, limited to 200 km/h is achieved without any gear change at all – whether automatic or manual. The two machines’ high power output offers a second advantage into the bargain: It means more recovered power is available because more energy can be recovered during braking. This increases efficiency of the drive unit. 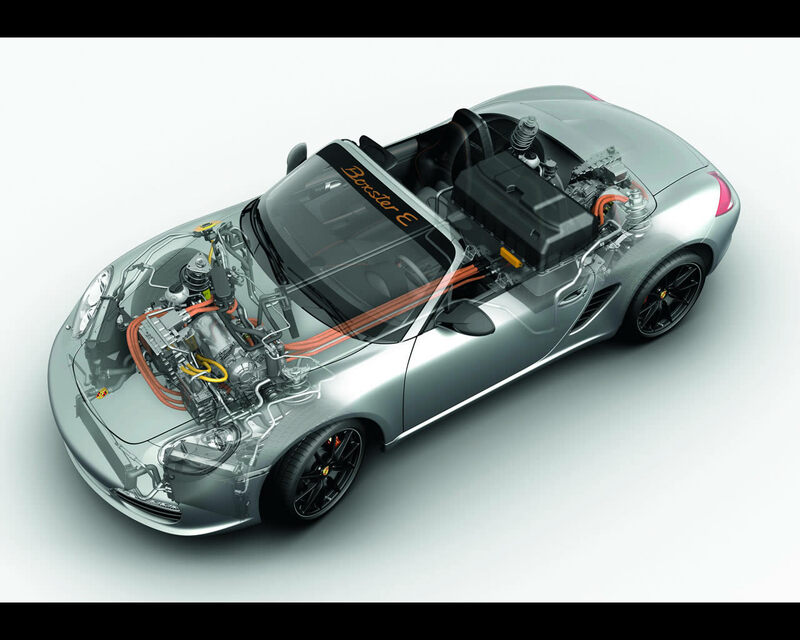 Irrespective of variant, the heart of every Boxster E is the 363-volt, high-voltage battery, developed by Porsche’s own engineers and manufactured by Porsche as well. This lithium iron phosphate-based traction battery is fitted in place of the combustion engine. Each of its cells has a nominal voltage of 3.3 volts and an individual capacity of 20 Ah. Based on the NEDC, the combined energy from 440 individual cells is good for approximately 170 kilometres of driving pleasure in the Boxster E with its ready-for-the-road weight of a mere 1,600 kg. For an overall weight of 341 kg, the battery's energy content is 29 kWh of which for inherent physical reasons approximately 26 kWh are available for use – an outstanding performance for a battery. 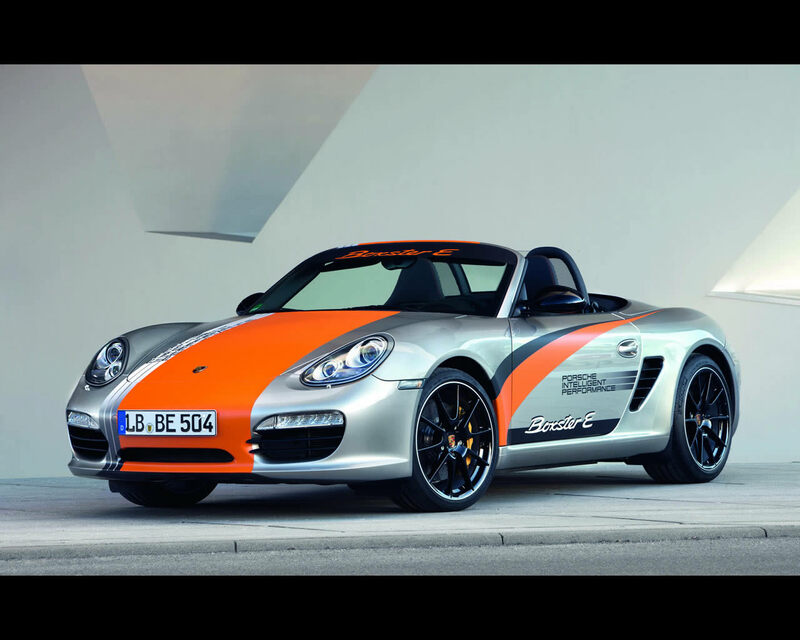 Its maximum power output is 240 kW (321 hp), or 60 kilowatts more than the all-wheel Boxster E draws under full load. The battery and power unit components are connected to two water cooling circuits. As with the conventional power unit, the heat exchangers are accommodated behind the front air intakes. The traction battery is charged via a charging cable. Engine braking with energy recovery - Not only are the clutch pedal and gearshift lever absent in the Boxster E, there is no rev counter either. In its place is a special E-Power meter in the central instrument cluster display. A swing to the right indicates power call-off and to the left power recovery. Recuperation – namely the recovery of energy by using the electric motors as generators – can be modified by means of the push buttons in the steering wheel. The effect: a sort of on-demand engine brake. Otherwise, when the driver lifts his foot off the accelerator, the Boxster E simply sails on, using the moving vehicle’s kinetic energy. Among its other functions, the instrument cluster’s right-hand TFT display acts as an intelligent range management system, displaying useful driving information: the range remaining or how many miles can be gained by switching off the air conditioning system.